This photo was taken in the third week in September in 2013. The location was near the White House in Washington DC. The "Take It!" Came from stepping out of my car just as the sun was coming up. 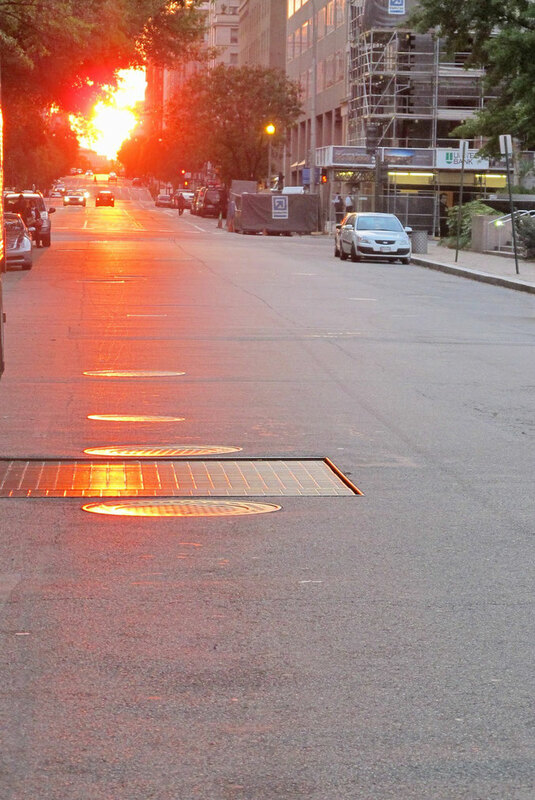 The light was blindingly bright and as chance would have it reflected not only off the street in the distance - but also the metal grates and covers as well. It was one of those rare moments of being in the right place at the right time. The After Take: When I showed this to those who are now my team of critics - many of whom have come to this country from elsewhere - they all enjoyed my saying as a part of the presentation "That is what they all say about America - but - Not so fast!" - lol. They had all heard the saying but heartily agreed that they found they could not just pick it up off the streets - but with hard work, there is a better life for them here than they had where they came from. We live in a country that we need to take very good care of. WOW!!!!! What a shot. One in a million! If only..... If we had streets actually paved in gold we'd either be terrible with our money or have an abundant surplus. If only it could be the latter. Time to get my chisel and get ready for some gold farming. I think this is one of my favorite shots I've seen here. The vibrancy of the sun is gorgeous. We don't get them like that here.